Nevada fifth-graders! Tie up your shoe laces, put on your adventure hats, and pick up your backpacks. There is exciting news in store for you! Beginning in July, a Nevada law will encourage school children aged 9-11 to visit and play in any of Nevada’s 26 state parks for free. Nevada’s “Kids to Parks” program was prompted by new state legislation which was signed into law by Governor Brian Sandoval in May. It is modeled after the federal Every Kid in Park program, which offers passes to fourth-graders and their families for free admission to more than 2,000 federal public lands, waters, and shores. Assembly Bill 385 made headlines when fifth-graders from western Las Vegas schools wrote letters to their legislators showing their support and appreciation for the bill. The new legislation ensures that every fifth-grader in the state has access to a pass that gives the child and anyone accompanying them free admission to any state park and recreational area for one year. With the Every Kid in a Park pass for fourth-graders already in place, Nevada’s new pass means that school children in the state will have two continuous academic years of free entry to its national and state parks, a move applauded by parents, educators, and children themselves! This is the second of Sandoval’s initiatives this year that promotes increased access to the outdoors for Nevada’s children and families. In January, the Nevada governor directed $13.2 million in state general funds to the state park system in order to boost the state’s flagship Explore Your Nevada initiative. Nevada is not the only state thinking about ways to encourage school children to get outdoors. States such as Indiana, Maryland, New York, Wyoming, Idaho, and New Mexico have been honoring the federal Every Kid in a Park pass in their state parks. Last year, Indiana State Parks declared that they would provide free admission to fourth-graders with the federal pass. Since Indiana State Parks charge park visitors a vehicle entry fee, this allowed for free entry to parks not only for the fourth-grader but also for all those accompanying the fourth grader in the same vehicle. Similarly, in Maryland, Governor Hogan announced that the Every Kid in a Park pass would be accepted by all state parks for the 2016-2017 school year. Not to be left out, New York, too, honors the federal pass both in state parks and in historic sites. In Wyoming, the fourth grade passes are being accepted by the state parks for the second year in a row. New Mexico State Parks allow free entry for fourth-graders with the federal pass and, in the past, have aimed at connecting four million fourth graders with nature through this program. The importance of bringing children and adults closer to nature cannot be overstated. Studies have shown that for children, connecting with nature translates into enriching social experiences with families and friends. Being outdoors helps children to be creative, curious, explorative, and create great memories that they cherish as adults. Besides contributing towards positive psychological development in children, the natural world also helps them remain fit and healthy. The American Heart Association recognizes childhood obesity as the number one health concern of American children and prescribes outdoor physical activities as prevention. Surveys reveal that Americans perceive nature to be integral for their physical, spiritual, and emotional development. And spending time outdoors during childhood significantly increases the chances that children will develop a lifelong love and appreciation for the outdoors, and continue going back year after year, with or without the pass. Nevada’s new legislation giving children and their families more opportunities to enjoy nature and the outdoors is a welcomed initiative that should be replicated by the rest of the nation. We encourage other states to follow Nevada’s lead. 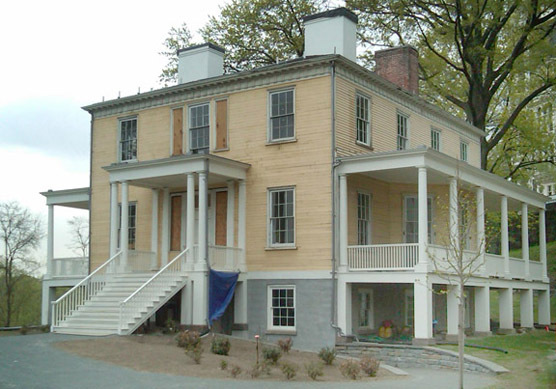 Hamilton Grange National Memorial, the home of founding father and Harlem resident Alexander Hamilton, will be the location for the kickoff of Every Kid in a Park NYC. NEW YORK – As part of President Obama’s Every Kid in a Park initiative, National Park Service (NPS) Director Jonathan B. Jarvis and President of Scholastic Consumer and Professional Publishing Hugh Roome will host the Every Kid in a Park NYC celebration to announce a new collaboration with Scholastic. Jarvis, Roome and others will join 200 fourth-grade students at Hamilton Grange National Memorial as they participate in activities to highlight the potential of parks and receive free passes to America’s federal lands and waters. Scholastic, the global children’s publishing, education and media company, has created a free educational program for fourth grade classrooms for Every Kid in a Park, which is available for teachers nationwide to download at www.scholastic.com/everykid. “This is an unprecedented opportunity to bring Every Kid in a Park directly into the classrooms of every fourth-grade teacher in the country,” said Jarvis. The Every Kid in a Park program seeks to connect young people with the great outdoors. The program allows fourth graders nationwide to go to www.everykidinapark.gov and obtain a pass for free entry for them and their families to more than 2,000 federally managed lands and waters nationwide for an entire year, starting September 1, 2015. Press wishing to attend should RSVP at the email link on this page. WHO: Those scheduled to attend include: Jonathan B. Jarvis, Director, National Park Service; Hugh Roome, President of Scholastic Consumer and Professional Publishing; Thomas L. Tidwell, Chief, U.S. Forest Service; Joshua Laird, Commissioner, National Parks of New York Harbor; Dominique R. Jones, Executive Director, Boys and Girls Club of Harlem; Orin Kramer, Board Member, National Park Foundation. WHAT: “Every Kid in a Park NYC” is the New York area kickoff of this White House initiative to urge fourth grade students and their families to visit parks of all sizes, from local community parks to historic sites like Hamilton Grange to vast national parks. A short opening ceremony will be followed by approximately 200 students engaging in activities that reveal the potential of parks: experiencing American history in the places where it occurred; recreating, including camping and water safety skills, and; appreciating our shared natural resources. Learn more: www.everykidinapark.gov. Organizations offering support for this nationwide initiative include the Sierra Club and the Outdoors Alliance for Kids (OAK). WHEN: Thursday, October 29, 2015, 9:30 a.m.–1:00 p.m. ET. This event will be rescheduled or cancelled in case of rain. WHERE: Hamilton Grange National Memorial, located at 414 West 141st Street in Manhattan between Convent and St. Nicholas Avenues, preserves the home of founding father and Harlem resident Alexander Hamilton. The historic home is located within St. Nicholas Park, a New York City park. Stretching from The Battery at the southern tip of Manhattan into three other boroughs, and beyond the Verrazano Narrows Bridge to New Jersey, the National Parks of New York Harbor includes 10 national parks with 22 natural, historic and recreational sites. These national parks preserve special places that tell the story of America and its leading city. Learn more: www.nps.gov/npnh/index.htm .